Fined, jailed, banned. Three words all heavily associated with social media platform, Instagram, over recent days. The social media platform is under fire from the British Government and advertising and marketing authorities but not for the same reasons. So, what does the future have in store for Instagram? Instagram, founded in 2010, purchased by Facebook in 2012. The app holds more than 1 billion users worldwide, many of whom can thank the app for a blossoming career in “influencing.” A controversial term no doubt, deemed irrelevant by many but an aspirational career for most. The “influencer” is an individual with a significant number of followers and knowledge and expertise within a specific area, be it fashion, lifestyle, home decor, the list really is endless. “Influencers in social media are people who have built a reputation for their knowledge and expertise on a particular topic,” Influencer Marketing Hub. Instagram are also responsible for a new age of “supermodels,” or as many refer to them “Instagram models.” A user on Quora defined the Instagram model as a “highly attractive, big online presence. They usually have a mass following on Instagram and take pictures for pay or for sponsors.” The Quora user goes onto explain that “Instagram Model” is not a career that can be easily worked for but rather you are “dubbed an Instagram model if highly attractive with a large social media following.” Many would even label the oldest Jenner sister, Kendall, as an Instagram model, despite walking in a number of high fashion shows, including Victoria’s Secret. To keep it simple, Instagram models, influencers and bloggers are a new form of advertising. Speaking of Kendall, Jenner is just one of many influencers, models and celebrities who have come under fire from the likes of the CMA (Competition and Markets Authority) and ASA (Advertising Standards Authority) for not disclosing paid and sponsored promotions to their followers and fans. The story unfolded following the release of Netflix’s Fyre documentary where it was revealed Jenner was paid $250,000 for posting a simple orange tile to her Instagram feed to promote the doomed Fyre Festival, but lest we forget Jenner was not the only model to do so, Hailey Bieber (formerly Baldwin), Bella Hadid and Shanina Shaik with many others came under fire for failing to disclose the paid promotion. The release of the Fyre Festival documentary has unfolded many a terrible tale about the doomed festival that left many “influencers” stranded in the Bahamas with little food and water, however the story that seems to have stuck in the mind of many viewers is the hefty $250,000 paid for promotion to Jenner and co., who has failed to publicly comment or reimburse the money. The documentary has led to a mass cull on the social media platform from marketing and advertising authorities who have threatened the likes of singer, Ellie Goulding, Made in Chelsea star, Louise Thompson and Love Island contestant, Olivia Buckland with large fines and even jail time (up to two years). Now, many will remember that the ASA put the #ad movement into place around five years ago. Whilst many still abide by the rule and label any products and services that may have been gifted to them, given to them in exchange for money or sponsors with the hashtag #ad, others have let the rule slip. The slip has led to marketing and advertising authorities to enforce a new and stricter rule for influencers to abide by. The #ad must now appear in posts that include services and products gifted to influencers in exchange for money and sponsors, any products and services sent to influencers for coverage only and for fashion influencers the rule extends as far as enforcing the #ad to be placed in posts advertising products that they have purchased themselves that they may tag/advertise within an Instagram post and/or story. Failure to do so can result in significant fines and even jail time. That doesn’t mean lines can’t be blurred, The Guardian’s, Amelia Tate, laughs at an example of an “#ad” by Khloe Kardashian, where Kardashian states “this is more than just a #ad because I truly love these delicious, soft, chewy, vitamins,” Well played, Khloe. Others have conveniently placed the #ad behind watermarks and logos within Youtube videos. So, let’s put this into perspective as I can imagine many of you might be sitting here reading this wondering, what does it matter? Surely enough of us are of sound enough mind to realise what is clearly an endorsement and what isn’t? However, we can’t claim that we haven’t once fallen victim to the ads on Instagram, (heck I was tempted to purchase a £400 “use at home botox treatment”.. I’m 21). And how can we not when we have such powerful celebrities, influencers who we follow over a long period of time and begin to trust endorsing these things without #ad disclaimers? Regardless of whether you are a victim to the lure of Instagram adverts or not, there are many young, impressionable individuals out there following these and trusting the words that are typed my these well-paid influencers and celebrities when no real result/service/quality is guaranteed. And quite frankly, who wants to waste their money on such a product? Now, if you’re sitting here over-thinking that time you asked an influencer what make-up brand they use or that time you innocently tapped to see where their outfit was from without noticing a #ad within the caption, we hate to tell you but the concept of #ad is about to get even more complicated. 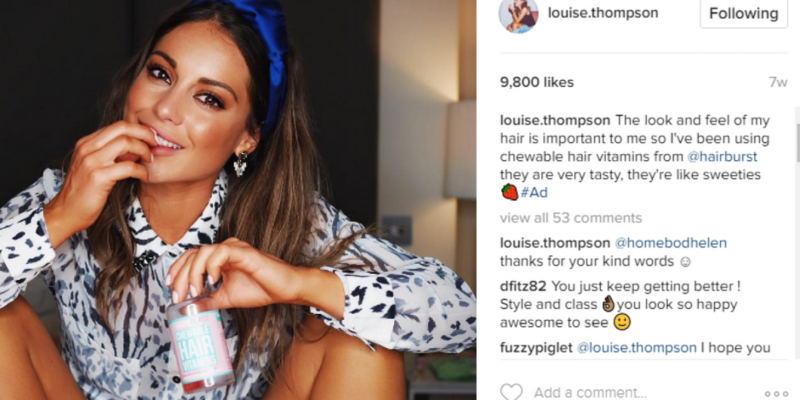 There are “wannabe influencers” out in the world, that’s guaranteed but some will go as far to state #ad in association with a brand that has nothing to do with them. Why? Atlantic’s Taylor Lorenz investigated and discovered hundreds of these wannabe influencers are faking brand deals across Instagram in a bid to look more “famous” than they are. Next we have “astroturfing”… An emotional Twitter thread that will resonate with hundreds of thousands of young people. The thread is so authentic, so relatable, how can we stop reading? Answer is, we can’t. We read until the end until the miracle product that fixed this individuals acne, blackheads, or helped them lose 3 stone in a mere 10 days is revealed. It’s fabricated. It’s fake. It’s pretty dangerous. Whilst it looks like a normal teenage girl posting the thread, looking out to help everyone else just like her, the real face behind the screen is a huge corporation, a new start-up company, a facade. Most recently, Kendall Jenner came under attack from followers and fans for teasing a huge reveal that was one of the “hardest things she’d ever had to discuss” many fans anticipated some hard-hitting news, just for Jenner to release a video discussing her acne that ultimately fuelled a Pro-Activ skincare ad that she claims cured her acne. 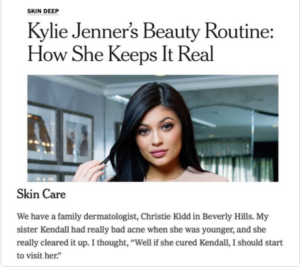 Many failed to sympathise with Jenner and called her out on social media as it was also revealed Jenner’s acne was “cured” with the help of a Beverley Hills dermatologist.